Are all A5 processors the same as another? 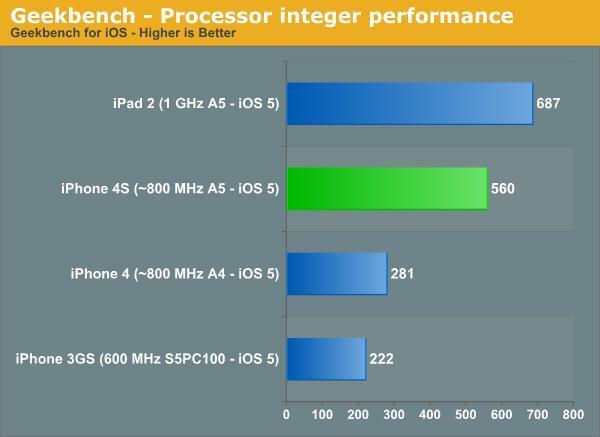 Not so, says AnandTech, which looked into the iPhone 4S‘ processor compared to others, including the A5 chip in the iPad 2. The site compiled known benchmarks and “compared them to our existing database of tests.” Bottom line? 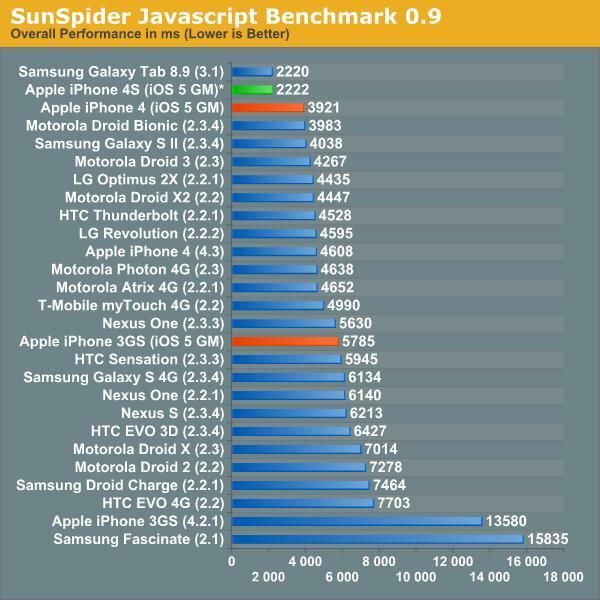 The iPhone 4S is underclocked to roughly 800 MHz, making it slower than Apple‘s current tablet, but still plenty fast, says the site. As for why it’s underclocked — well, unless Apple’s willing to comment on this, there’s really only speculation. It could be to preserve battery life — after all, the iPhone’s battery is way smaller than the iPad’s — or maybe a desire to minimize heat, as thermal dissipation may be more of an issue in such compact casing. AnandTech notes that Apple is especially good at optimizing the performance of its OS/apps, to minimize any resulting performance hits, and it seems to suggest that folks shouldn’t take hardware specs too much to heart. Indeed, software can make a huge difference. Makers can stuff multi-core 1.5 GHz chips in their wares, but if the OS ties up all the resources, it won’t make any difference to the user. 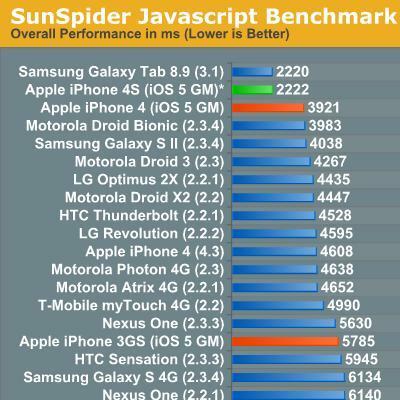 The iPhone 4S’ Safari browser also performed well — it beat out the GTab 8.9 by a small margin, and ran nearly twice as fast as the iPhone 4’s. As for stuff like gaming, the site also says, “The GPU power in the 4S should be more than enough to run any well written, current generation title at well north of 30 fps on its display.” So yeah, take this as a sign that Infinity Blade II will probably be sick on the 4S when the game lands in the App Store on December 1st. Does this make any difference in your plans to buy/bypass the iPhone 4S? Or do you have experience with another “fast” phone or tablet? Is it as speedy as you anticipated, or does it still lag and churn, despite the hardware? 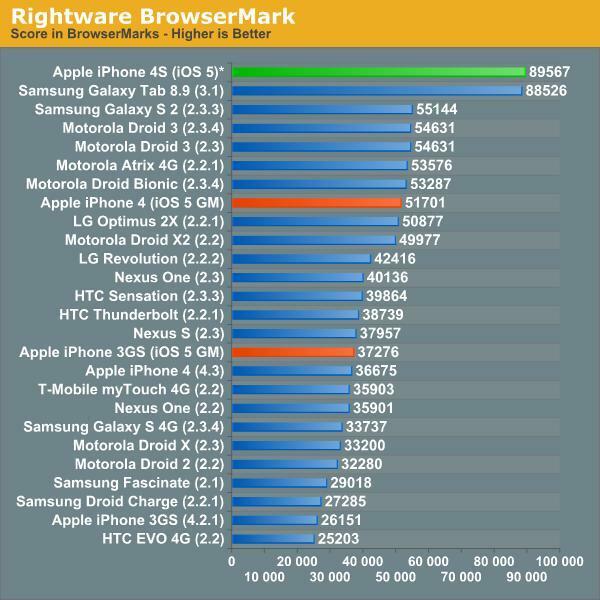 For even more benchmark charts, hit up AnandTech at the source link above.